The time of holiday parties is upon us, and I've got everything you need here to be the hostess (or guest!) with the mostess! 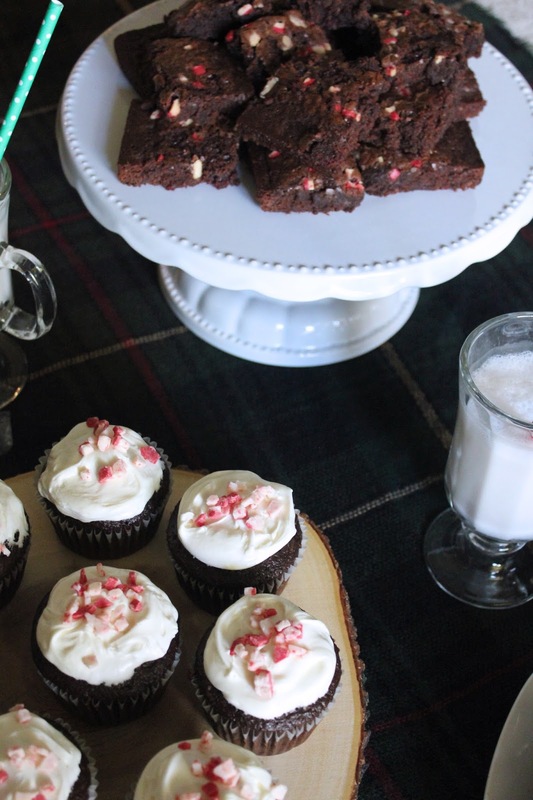 Whether you're wanting to serve up some scrumptious holiday goodies (I've got three mouth-watering recipes here for you), throw the best party for your attendees or searching for hostess gifts - I've got you covered. Melt the butter and pour into a large bowl. Combine with sugar using a spoon or whisk. Add all four eggs and beat the mixture until it is fluffy! Add the salt, cocoa and vanilla. Stir well until all combined. Add the flour and stir until mixture is thick. Stir in Andes Baking Chips (as much as you desire for mint amount). Pour batter into a greased 9x13 pan, and bake at 350 degrees for 20-30 minutes. Make sure to keep and eye on them in case they cook faster! Remove and allow to cool, then enjoy! *I also used my above brownie recipe (minus the peppermint chips) and mixed the two for a gingerbread/chocolate masterpiece! Mix together Gingerbread mix, evaporated milk and melted butter. Grease a 9x13 pan and pour the batter into the pan *THIS is where I poured the chocolate brownie batter in first and swirled the gingerbread batter on top! Preheat oven to 350 degrees and line a cupcake tin with liners. CUPCAKES: In a large bowl combine cocoa powder, flour, baking soda, baking powder and sea salt. In a separate bowl, combine sugar and butter. Add in eggs, one at a time. Stir in peppermint baking chips and slowly add in buttermilk. Slowly mix dry ingredients into wet and stir until all combined. Scoop batter into liners, filling 1/2 - 2/3 of the way full. Bake for 20 minutes or until cooked through. Set aside to cool for 20 minutes before removing and placing on baking rack. FROSTING: In a large bowl beat egg whites, sugar and salt with an electric mixer or stand mixer for 12-15 minutes. Add in butter, one stick at a time. Continue mixing for another 3-5 minutes or until frosting is thick but not clumpy. 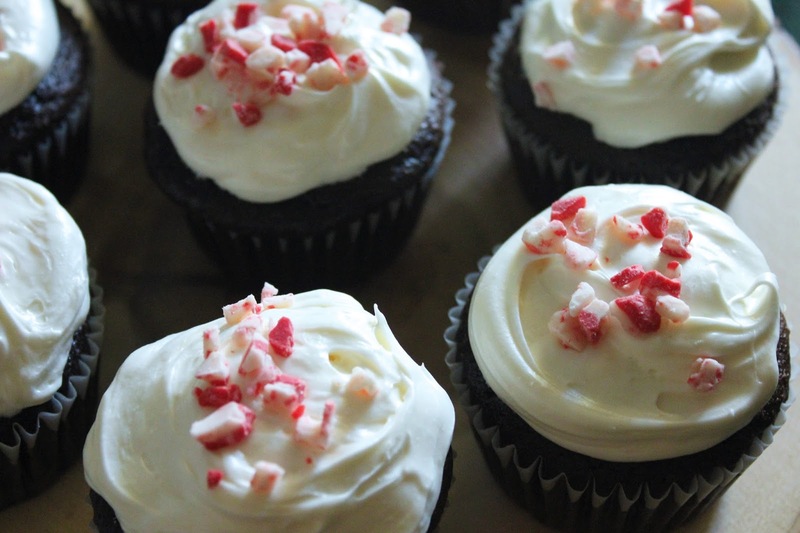 Frost cooled cupcakes and sprinkle with extra peppermint baking chips on top! When you know that guests are coming to your home, make sure to send them directions/gate codes ahead of time. That way, you won't be scrambling to answer all the confused phone calls when they are nearby. Check on any food restrictions and make sure to offer options for those with certain allergies (or eliminate items completely for severe cases). It's best to have small labels for your items so guests know what they contain just in case. If you're guests are bringing kids, make sure to stock on some options for the little ones as well! Stock the bathroom with extra tissues, toilet paper and basic medications if needed. Make sure to have a couple open outlets for guests that may need to charge their devices while possibly away from their kids, pets or others during your holiday party. Charging stations are the best! In the case that guests will need to access your wifi, make sure to display your password somewhere easy for them to read and find - unless it's something that you've memorized well. If you have guests staying over at your home, make sure they have storage area for their belongings, fresh linens in the room and bathroom, reading material on the nightstand, and that all lighting/fans work properly! Instead of having a full bar, make one signature cocktail and then have an assortment of wines and beer - much easier and cost friendly! Light candles to set the mood (dim lights create a cozy environment), but make sure to place them out of the way of people or items that could burn. Create a comfy spot for your guests to lounge and be sure to have plenty of seating. Clusters of sitting areas lead to great conversations! Remember to stay off your cell phone (unless necessary) and be in the moment with your guests! Make sure to try out any new, bold recipes before the event - it will save you some embarrassment if you've made an error. Have ample silverware and other supplies on hand in the case of surprise guests or accidents. Make sure you take the time to get to know and visit with each of your guests - nobody likes to be ignored! NEVER run out of ice! Be sure to stock up ahead of time to eliminate those mid-party runs to the store. Make sure your air conditioning is set at the perfect room temperature, that way nobody is sweating or freezing while they party! Give yourself enough time to have your home party-ready at least 30 minutes before your guests begin to arrive and take a minute for yourself. Plus, if you're family is like mine, you'll have some people show up earlier than expected if they're ready! Make sure to send hand-written thank you cards to any one who helps or brings dishes/gifts to your event. It's so unexpected these days, and those little things will really make an impression. Searching for the perfect gift for your party hostess? Here's a round-up of some of my favorites! Just click the item on the picture to be directed to the site to purchase! I hope that all of these recipes, tips and gift ideas are helping you be ready for any upcoming holiday parties! After all, this is the season to be merry! Tell me about any fun upcoming plans you have for the holidays!? 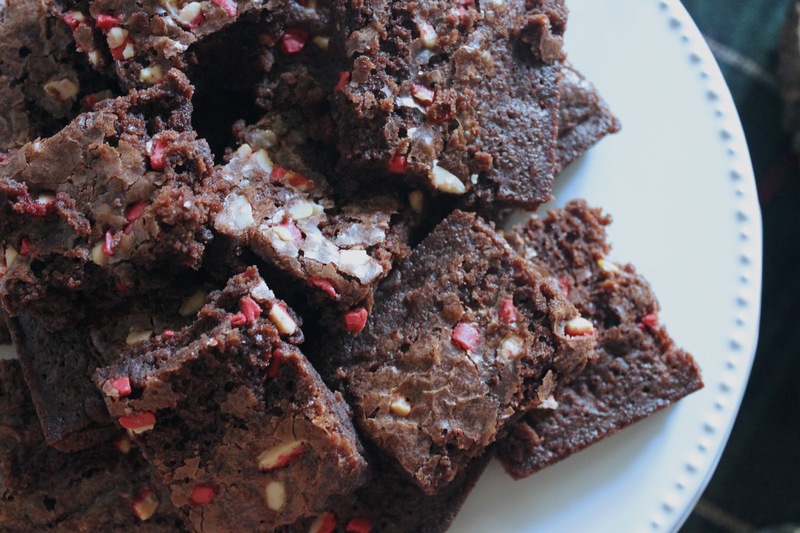 Those brownies sound amazing! We don't have any hosting to do this year but these would be great to bring to a gathering! GREAT post! 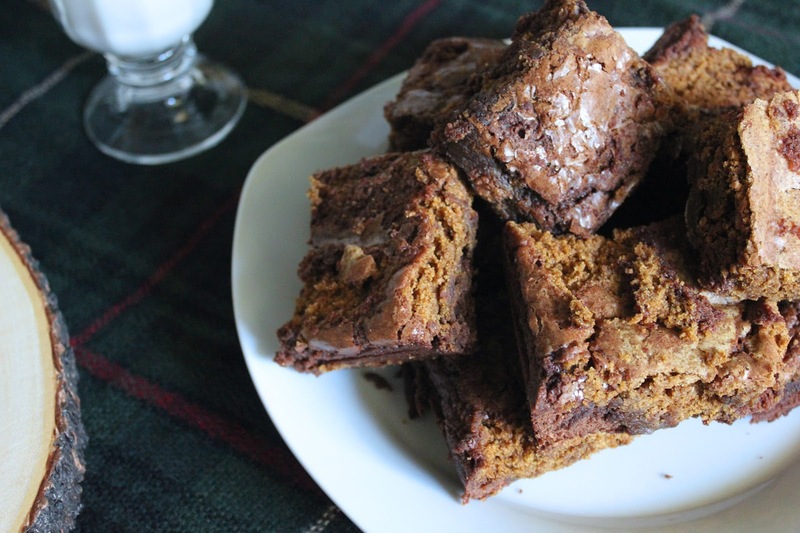 those brownies look amaz and I 100% agree with your tips! Thanks Preeti! They are highly addictive, I'm warning you! And thanks so much - I think the little things really make an impression when you're catering for others! 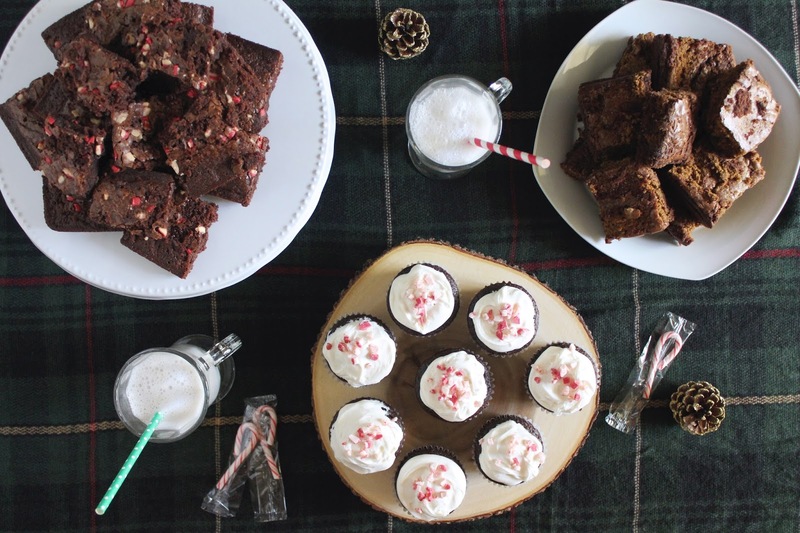 Oh my gosh - those brownies and cupcakes look so darn good!! I need to follow this recipe.. everything I bake is doomed! Haha. These look amazing - great post! You must be the best hostess because your recipes and images always look amazing! I would want to come to one of your get-togethers! Yummy!! These treats look divine!! You must be THEB BEST hostess! !